For gallantry and intrepidity during action against enemy Japanese forces on Tarawa, Gilbert Islands. 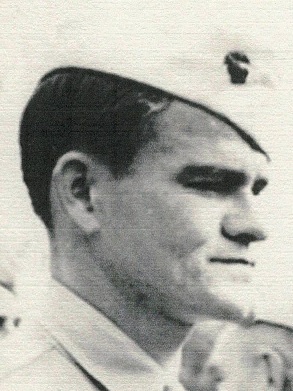 On November 22, 1943, he was assigned the mission of investigating the area immediately forward of the front lines. His commanding officer knowledge of a group of isolate Marines in the area and desired information of them. In the face of heavy enemy machine gunfire, he with complete disregard for his own personal safety, worked his way forward. The first friendly troops that he encountered informed him that they had been pinned down in their present positions since the initial landing on Nov. 20, 1943. He was further informed that the officer in command of the group was some 40 yards to the front. Against heavy enemy fire he continued his reconnaissance, finally making contact with the officer in command. “After gaining the desired information he made his way safely to his own lines. This information was instrumental in bringing about relief to the isolated unit, and evacuation of several wounded. The conspicuous gallantry and intrepidity displayed by him were in keeping with the highest traditions of the U, S. Naval Service.